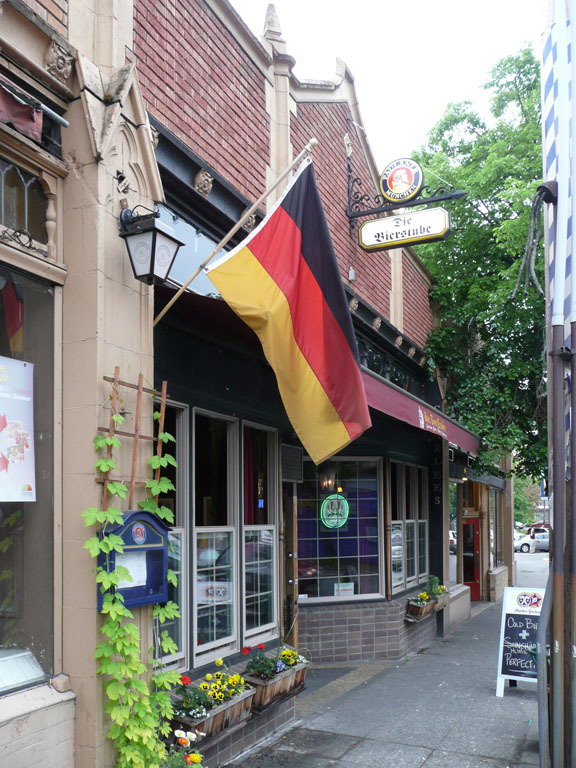 Die Bierstube is part of a group of German bars in Seattle that also includes Prost and Feierabend. There is a great selection of German beers on tap including a few dunkels and a dunkelweiss or two. The bar itself is not too large and get crowded on weekend evenings. There are two dartboards. The food is good German fare, but not much to make a meal out of. Mainly appetizer type food. Die Bierstube is in a North Seattle neighborhood and has a fantastic selection of German beers. The taps rotate to some degree but on our last visit all 15 beers on tap were from Germany except for one from Baron (a local brewery that only brews German styles). The beer is fresh and quite good. The place is essentially one medium-sized rectangular space with tall ceilings. There are wooden tables and benches as well as tall chairs along the bar. Small brass plaques on the tables note that in Germany it is customary to share your table with strangers. However, it has never been crowded when we have visited so we canâ€™t verify that this custom is actually followed by patrons here. The bar has a number of German ceramic beer dispensers. The bar has a very authentic feel, not like a place where tourists go, but where regular German beer drinkers would feel at home. There is a small menu of miscellaneous German-style snacks including soft pretzels and various sausages. The food is good but it is a small selection and not really for a full meal.